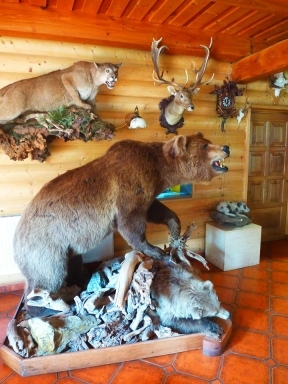 The guest house Grizzly is a newly built guest house in a wooden chalet style. 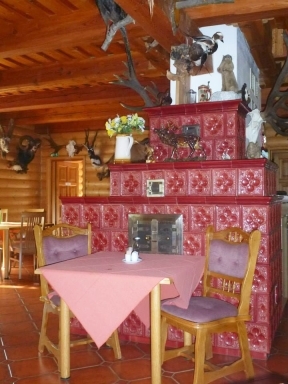 The guest house is located in Ludvíkov near the spa Karlova Studánka. 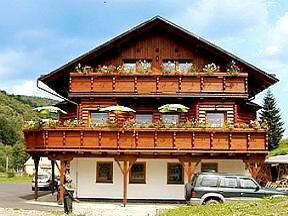 The closeness of the highest points of Jeseníky, spas and ski centres Praděd – Ovčárna and Malá Morávka – Karlov makes our guest house an ideal summer and winter holiday resort. Both those preferring sports, actively spent holiday and those preferring relaxation with culture and spa procedures, will get a slice of the action. Romantics would surely appreciate the beautiful colorful autumn that is here traditionally connected to mushroom - and cepe - picking. 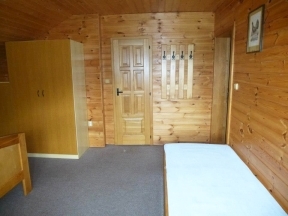 Types of rooms: Double - to four - bedded rooms. 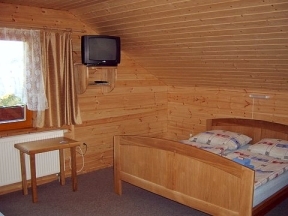 Sanitary facilities: Each guestroom is equipped with a lavatory, shower and hot water washbasin. 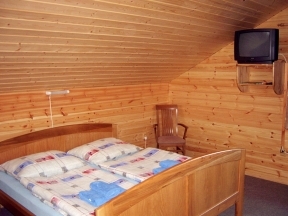 TV+Sat: Each room is equipped with a cable TV. Boarding: SelfA private restaurant, breakfast served from 7:30 to 9:00 (7 dishes choice), see below for more information. Non-smoking area: Smoking in the guestrooms is prohibited, allowed at the restaurant, except the lunchtime (11:00-15:00). 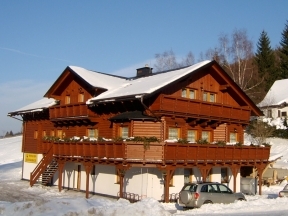 Ski depository: Our guest house is equipped with ski and clothes drying facilities and a ski depository. Massages, spa procedures: We can offer these services on the basis of an agreement with spa Karlova Studánka. 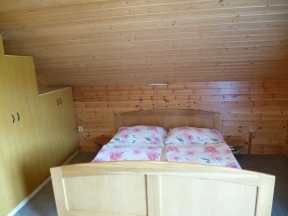 Suitable for families with children: Near the guest house, there is a playground with climbing frames, a swing and a merry-go-round, the ski lift beside the guest house is suitable to children as well. Credit cards: VISA, Eurocard, MasterCard, American Expres, JBC Cards. Car park: A car park with a large enough capacity is right in front of the guest house, out of the main road. Opening hours: Su – Thu 8:00 – 22:00, Fri – Sat: 8:00 – 23:00. 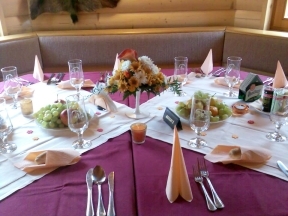 Meals: Classic Czech and Slovak cuisine, soups, ready-made meals, pork, veal and chicken specialities, venison specialities, fish, vegetarian meals, extensive choice of cakes and salads. MENU HERE. Beverages: Great choice of hard and soft drinks. Beer: Radegast 10, Pilsner Urquaell 12, non-alcoholic beer Birell. Out-door terrace: Terrace with service. 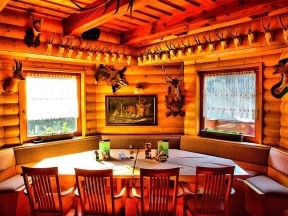 Non-smoking area: : Smoking is prohibited in the restaurant during the lunch (11:00 – 15:00). Credit cards: VISA, Eurocard, MasterCard, American Expres, JBC Cards, Diners Club International. : Take the road I / 44 to Bělá pod Pradědem, turn on the left at the crossroads to the road II / 450 (directions Bruntál - Ostrava), turn left in Vidly to the direction Vrbno pod Pradědem on the road II / 451. Turn right at the intersection on the periphery of Vrbno pod Pradědem and continue on the road II / 455 (direction Karlova Studánka) to Ludvíkov. The guest house is located in the village centre on the right side of the road. : Take the road I / 11 in direction Rýmařov, do not turn off to Rýmařov, keep on to direction Bruntál and turn left at the intersection before the village Malá Šťáhle and continue on the road II / 445 over Malá Morávka, saddle Hvězda to Karlova Studánka and to Vrbno pod Pradědem. : Take the road II / 452 in directions Vrbno pod Pradědem and Jeseník, in Vrbno pod Pradědem turn to the road II / 450 (direction Karlova Studánka) and continue to Ludvíkov. Local lines, long-distance line, Bus station "Ludvíkov, res. Stonozka" is 200 m beside the guest house. A train station Milotice nad Opavou on the train route Olomouc – Bruntál – Krnov is a starting point of the local track in direction Vrbno pod Pradědem. From that point onwards take any bus. 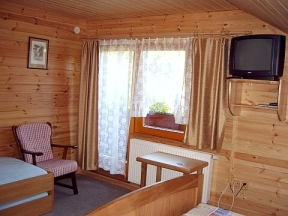 Occasionaly You can take the local line Bruntál – Malá Morávka (weekends and in season only) and continue further by bus.